DIY potted paper whites are simple and inexpensive to do and make a great holiday gift for friends and family! I hope you all had a great Thanksgiving and holiday weekend! The Christmas season has begun and if you’re family is anything like ours your sprinting to the finish line to get the activities planned and the names checked off the gift list. I’m joining some of my best blogging pals, including The host Krista from The Happy Housie to share a few DIY gift ideas for this holiday season. This year we’re scaling back considerably and focusing on less stuff and more quality time together. Our Christmas decor is simple this year and I’m finding that we’re also shopping simple this year too. Simple gifts don’t have to be thoughtless, it’s quite the opposite. I find that some simple things I love most. If you’re looking for something simple yet thoughtful this year these potted paper whites make great gifts for the gardener and non-gardeners alike! You don’t have to know much about gardening at all to have blooming paper whites this winter. They make great gifts because they require so little. Paper whites come in ready to plant bulbs that you can purchase from most any nursery. You simply place them in a shallow container, filling the container with potting soil, rocks or sand. Place the bulb only 1/4th of the way into the soul and water. The roots will grow down to the water. Keep in a sunny place but out of direct sun. Four weeks later you should have beautiful white blooms! 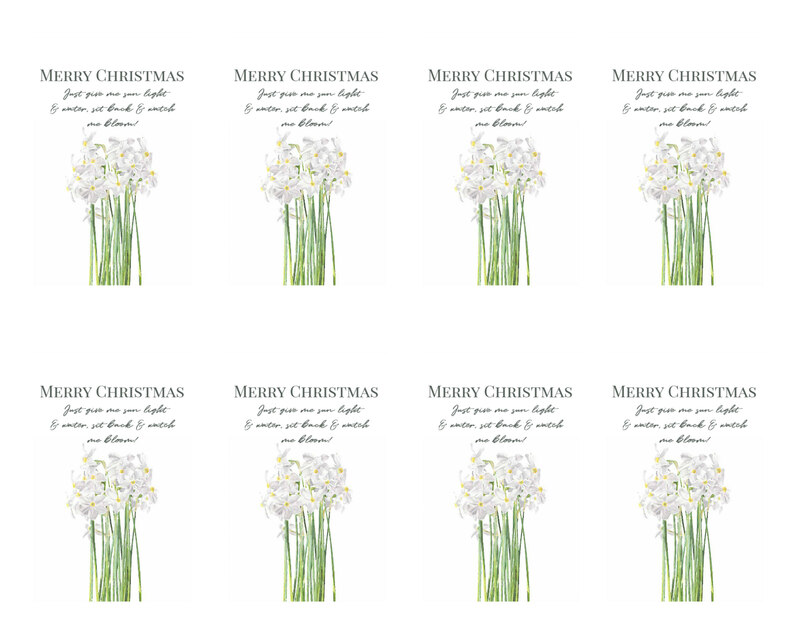 I’ve created some fun gift tags to include with your potted paper whites. Click here to open and print. The tags tell your loved one exactly what to do to make sure they see blooms before the end of winter. What makes these fun is that they can be planted one bulb at a time in a small container such as a tea cup. I found this cup and saucer at a thrift store for less that $2. Place the cup in a clear baggie, add some ribbon and you have a perfect hostess or holiday gift! Id you’re wanting to make a bigger impact you can plant several bulbs in a larger container such as a vintage bowl, trophy urn or planter. I found this iron stone chamber pot a while back for only $12 at an antique store. It’s quite stained on the outside but it makes such a great indoor planter that can be used time and time again. The options are endless and it’s hard to go wrong with this gift. It doesn’t have to be extravagant to be special. For more DIY gift ideas hop over to the next blog on the tour and get inspired. There’s something for everyone on your list. Merry Christmas, friends! Check Out Our Classic Christmas Home Tour! Simple doesn’t have to be boring. These are a beautiful gift. Thank you for sharing and for being a part of the blog hop. This is such a pretty and thoughtful gift idea! And can you believe that I’ve never had Paperwhites before? I think I need to gift these to myself! I adore your printables! and to be honest I’ve never had paperwhites before either!